Bring sophistication and organization to your wine collection and your home with this stately yet practical wine bottle organizer. 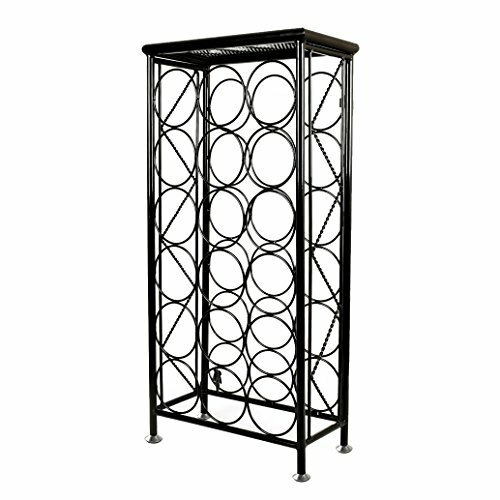 Nothing says elegance and class quite like a collection of wine handsomely arranged in this floor standing wine rack like this one, with its sleek black finish, rows of modern metal rings on the front and back, and artfully twisted metal bars on each end. This beautiful 18-bottle wine holder provides convenient and practical storage as well as classic style: Each individual wine bottle space is made up of 2 sturdy metal rings (1 on either side of the wine rack) that hold your bottles horizontally to keep the cork wet and prevent flavor-destroying oxidation from ruining your wine. This wine cellar rack's sturdy metal construction and 4 rubber-tipped feet help keep the wine stand steady and your wine collection secure. Use the shelf at the top of this decorative wine rack as a handy place to set wine glasses while you are pouring wine, or use it an extra space for decoration or storage in your kitchen, dining room, or wine cellar. Bring this stylish, convenient, and modern wine rack into your home to keep your wine collection both organized and beautifully displayed. *Official MyGift® product, includes wineglass spot removal cloth. * *Bottles of wine are not included. A stately and modern black wine bottle organizer with a top shelf and 18 circular bottle holders. Features durable metal construction and 4 sturdy, rubber-tipped feet to help keep your wine collection steady and secure. Holds up to 18 wine bottles and keeps them horizontal to keep the cork wet and prevent flavor-killing oxidation from destroying your wine. Made of heavy duty metal. Approximate Dimensions: 12.5" W X 26.5" H X 6" D.